This embroidery is approx 6 x 8" when finished. All materials are included. ( please note background fabric may differ slightly due to availability but will be as close as I can match) All my kits use a Contemporary 1 mm gold Indian cord for the main couching instead of 3ply twist along with traditional purl and check wires, T 70 or 71 cords, rococo, sequin waste, felt, beads, sequins, metallic leather and embroidery threads. Some all or a combination included depending on what your kit requires to stitch it. 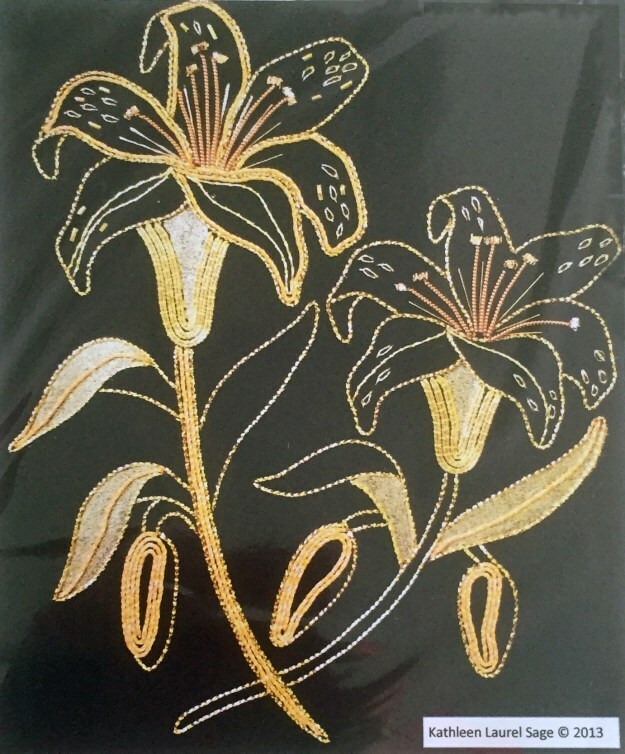 You will need an embroidery hoop to fit the project, cotton sewing thread and needles, and gold acrylic paint for those kits that specify its use.